Demands for flexibility and ease of use over a wide range of operating temperatures are being reflected in the latest temperature sensors. Eugene McCarthy reports. Infrared (IR) non-contact specialist Ircon has introduced the new 7V Series of IR sensors to the Modline 7. The new models provide solutions for the semiconductor industry and are one of eight in a series of new launches by the company. Combined with Ircon ModView Pro software and an extended five year warranty, the Modline 7 provides what the company describes as best-in-class solutions for demanding industrial environments (Fig 1). 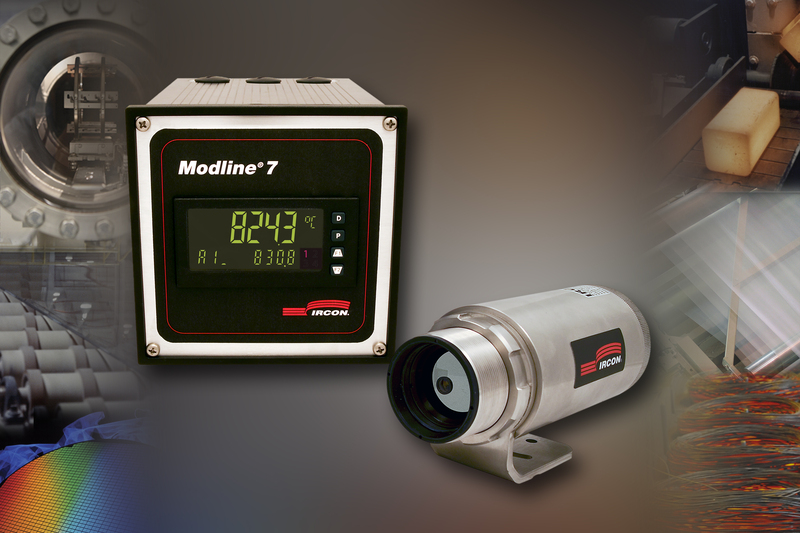 The new PROC-7 processor box allows full sensor operation through a push button panel and is part of a full line of accessories offered for the Modline 7 series thermometers. The sensor offers versatility with extended temperature ranges (-40°C to 3000°C), high-resolution optics and fast response times. The thermometer’s sensing head can operate as a stand-alone sensor, providing simultaneous analogue and digital outputs of process temperatures. Motorised focus control and both through-the-lens and laser sighting are standard on all units. The new thermometer’s intuitive sensor design — with integral water-cooling in a stainless steel enclosure or high-temperature water jacket — reduces installation and setup time. The water jacket is intended for use in ambient temperatures up to 315°C with an integrated air purge capability. An optional air purge collar accessory enables the lens to be cooled and kept free of debris in hot dusty environments. In addition, the Modline 7 standardised installation accessories and common Windows ModView Pro software platform minimise multiple product configurations at the user’s facility. Sensor setup and monitoring can be accomplished either from the rear panel of the instrument or from the ModView Pro software. This allows for remote PC-based sensor configuration, temperature monitoring, trending and archiving via an intuitive graphical user interface. For example, users can change the temperature display from degrees Fahrenheit to degrees Celsius, adjust emissivity levels, scale the range, focus the sensor, activate filters - such as peak hold, valley hold, and averaging - and save data for future reference or graphing. Meanwhile Raytek is celebrating a number of successful IR sensing projects. In one, a customer was looking for the most reliable way to monitor the short rotary kilns used to incinerate chemical waste that rotate at extremely slow speeds. To increase combustion efficiency, such kilns rotate at very slow speeds - typically 4-6 revs/h. Over time, the refractory brick protecting the kiln wall will degrade and need to be replaced. There is also the possibility that a single brick could fall, leading to a hotspot on the kiln shell and causing catastrophic failure. Taking action too soon will negatively impact productivity, while waiting too long may put a high cost capital asset at risk. The customer selected a Raytek CS210 system that is able to synchronise thermal imaging at speeds as low as two revs/h. In addition, these kilns are typically quite short, 10-15 m in length. The CS210 is specifically designed to detect each potential refractory loss across the shell lengths by providing a gapless sampling of pixels. In terms of savings made by the customer, the operational life of the refractory is extended. With no monitoring system, the refractory will be changed after a set period. Typical values may be 12 months between changeovers with a changeover cost of €382,000. Hence, by using the CS210 system, each month that the changeover can be deferred saves approximately €31,000. A second Raytek customer wanted to monitor and control polycarbonate film thickness by controlling the pressure and temperature of chrome rolls it used to extrude polycarbonate sold to the electronics and high grade plastics industries. The difficulty was that the customer wanted to measure the temperature of the chrome roll, which was very shiny - making accurate IR measurement difficult to achieve. After discussions, it was determined that the polycarbonate product temperature could be measured with a Raytek ES150 process imaging system. The output from the ES150 could be used as feedback to control the pressure of the chrome rollers, which is what the customer was ultimately trying to achieve. Today the customer is using the scanner in a monitoring mode and is looking at temperature profiles, since the proper amount of pressure is correlated with temperature in the heated chrome roll. If a temperature deviation of 5-8°C occurs, adjustments are made to chrome roll pressure parameters to influence the process. According to Raytek, the customer has saved on extrusion material costs by minimising thickness variations in the film through optimised chrome roll pressure during the extrusion process. Omega points to common questions that should be asked when thinking about using a thermal imager. Firstly is, “Why?” Omega says that thermal imaging is ideal where there are moving objects, or where non-contact measurements are required because of contamination or hazards such as high voltage and high temperature. Resolution is an important consideration, too. Thermal cameras can pick up small problems at greater distances than other measurement techniques. Then there are a number of critical considerations to be made regarding how the thermal imager will be used. These include: field of view (target size and distance); type of surface being measured (emissivity considerations); spectral response (for atmospheric effects or transmission through surfaces); and temperature range and mounting (handheld portable or fixed mount). Other considerations include response time, environment, mounting limitations, viewing port or window applications, and desired signal processing. Once these issues have been resolved, it’s time to find the most suitable thermal imager for a particular application. Omega recommends buying an IR camera with the highest detector resolution/image quality that the budget allows. “Most IR cameras have fewer pixels than visible-light cameras, so pay close attention to detector resolution. Higher resolution IR cameras can measure smaller targets from farther away and create sharper thermal images, both of which add up to more precise and reliable measurements,” adds the company. When it comes to the food industry, monitoring of temperatures is among the most important measuring tasks. To ensure constant process quality, the temperature sensors used have to be regularly calibrated. This is time-consuming and expensive. In order to overcome this, IFM uses its TAD temperature sensors. These use two different sensor elements which monitor each other during the process. So any occurring drift is reliably detected. Furthermore, if one element fails, the process can be continued with the second measuring element acting as a backup function. For customers, the two high-precision and long-term stable measuring elements of the TAD temperature sensor ensure reliability and quality in the process. The temperature-proportional 4-20 mA signal enables processing via all common controllers. To ensure easy further processing the signal for the relevant temperature range is scalable. The diagnostic output warns in the event of ‘drift warning threshold reached’ and ‘drift alarm threshold reached’. IFM warrants a reliable drift detection within the preset drift thresholds for a period of five years. The integrated ASEPTOFLEX adapter thread enables hygienic fitting to all common process adapters. The completely sealed housing guarantees protection rating IP 69 K. The selected design reduces build-up of dirt and can easily be cleaned all around. Text: Yokogawa Electric Corporation and SICK have signed an agreement whereby Yokogawa will distribute and service SICK process analytical instrumentation on a global scale. Three years ago both companies announced the establishment of a distribution agreement targeted for the European process analytical markets as the product portfolios of both companies are, to a large extent, complementary. With this new agreement both companies confirm this successful strategy and widen it to a global scale. Seizo Nakamura, business development manager for the analytical products business division at Yokogawa, stated that the collaboration between the two companies has been well received by the customers in the field of process analytical instrumentation and has significantly improved the ability of Yokogawa to provide turnkey process and environmental automation solutions for process industries from a single supplier. In addition, Michael Markus, head of marketing and sales of SICK’s analyser division, pointed out that the collaboration with Yokogawa has allowed SICK to broaden its market position as a solution provider in process analytics. This is accomplished by the addition of SICK’s analytical product offering to Yokogawa’s specific process analytical applications and system integration know-how to provide a total solution. The next step in the global distribution agreement has seen Norbert Zeug, formerly staff member of Yokogawa in Europe and since March 2012 in charge as strategic industry manager chemical and hydrocarbon process industries at SICK, being nominated as the liaison manager of co-operation between the two companies.